With press and consumers around the world clamoring over the new iPhone 6 and iPhone 6 Plus, people who aren’t concerned with the newest-of-the-new mobile technology are starting to turn their attention towards older iPhone models. We took a look at the FREE iPhone 5c last week as one of the best smartphone deals on the market today, but what about last year’s iPhone 5s? iPhone 6 offers a larger screen, at 4.7″ corner-to-corner, and was introduced as Apple’s thinnest smartphone ever, at only 6.9mm. iPhone 5s on the other hand measures 4″ corner-to-corner and weighs 7mm. Gotta Be Mobile puts the new display of the iPhone 6 on their “like” list, but reports that its larger size makes the new iPhones more susceptible to slips and falls (just the reason we’ve created a better way to get a grip with an iPhone 6 case). Size aside, iPhone 5s will be cheaper than iPhone 6. While it’s offered now for only $99 with a 2-year contract, you can easily find used models on eBay for even cheaper. To get into more of the nitty-gritty specs, visit Apple for a full comparison of iPhone models. 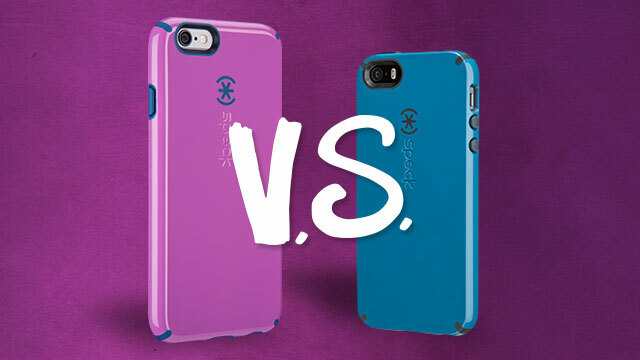 Whichever iPhone suits your needs, you’ll want military-grade protective iPhone 5s cases and iPhone 6 cases to protect it from daily drops and spills. Don’t miss out – Sign up for our newsletter and follow us on Facebook to receive exclusive deals for the upcoming holiday season!